Located at the top of Castle Hill in the picturesque Castle District of Buda, the Palace was first inhabited by King Béla in the 13th century who, after the Mongol invasion, turned it into a fortified stronghold against further attack. During the next 700 years it was the residence of many royal figures. The strategic location of Budapest, situated in the heart of Europe and straddling the Danube, offered whoever controlled the city a defensive position and potential control of the main waterway and this led to repeated invasions, followed by rebuilding in the style of the period. The castle has a mixture of architectural styles, ranging from Gothic to Baroque. Today it is the country's most important cultural centre housing numerous museums and the majority of the buildings are historical monuments. The Budapest History Museum contains an exhibition explaining the history of the city as well as archaeological remains of the palace. Also within the palace complex are the Hungarian National Gallery, the National Library and the Ludwig Museum. City Park, or Városliget, in Pest's northeastern reaches, makes a welcome break from the built-up inner-city area and incorporates many of Budapest's drawcards. The entrance to City Park is Hosök tere (Heroes' Square), which has the nation's most solemn monument - an empty coffin representing one of the unknown insurgents from the 1956 Uprising - beneath a stone tile. The inspirational Millenary Monument, a 36m (120ft) pillar backed by colonnades, defines the square. The Angel Gabriel tops the pillar, offering King Stephen the Hungarian crown. To the north of the square is the Museum of Fine Arts, which houses the city's outstanding foreign works (especially the Old Masters collection), while to the south is the ornate Palace of Art. Inside the City Park is the City Zoo, with its beautiful Secessionist elephant house. Gellért Hill offers unrivalled panoramic views of the city, taking in both Buda and Pest and the meandering Danube in between. The hill is named for a bishop who was tasked to convert pagan Magyars to Christianity but, according to legend, he was killed by being rolled off the hillside in a barrel by militant heathens. A statue of the martyred Bishop stands at the base of the hill. On its summit stands the Liberation Monument, a female figure holding aloft the palm of victory, dedicated to the memory of Soviet troops who died freeing Hungary in 1945. With the fall of communism the inscription was changed to honour those who died for 'Hungary's prosperity'. Behind the monument is the Citadella, or fortress, built after the 1848 revolution to provide military control against further uprisings. Today it houses a hostel and a museum. The hill is also home to several historic spas, valued for their medicinal qualities since the Turkish occupation. The city's most famous spa, the Gellért Baths, is attached to the grand establishment of the Art Nouveau Gellért Hotel. Here visitors can relax in the thermal waters of the Roman-style pool with its lion-headed spouts, surrounded by columns and mosaic patterns, or indulge themselves with private therapeutic treatments or a massage. The Chain Bridge was the first stone bridge to be built over the Danube and is the most famous with its lion statues. Today nine bridges span the river linking Buda to Pest, but Chain Bridge takes pride of place as the city's symbol, a magnificent sight when floodlit at night. It owes its construction to Count István Széchenyi who decided to build a permanent crossing after having to wait a week to cross the river to bury his father. The Chain Bridge was built by William and Adam Clark who constructed London Bridge. It was considered an amazing feat of engineering when it was opened in 1849. At the foot of the bridge is Kilometre Zero, the point in Budapest from where all distances are measured. Budapest rests on a network of warm thermal and cool mineral springs. As a result, communal bathhouses, pools and spas are a house speciality. They are truly relaxing and are the perfect salve after a day spent exploring the city on weary feet; for many visitors the bathhouses rate among the city's greatest delights. They're clean, safe and cheap. Some are architectural attractions in their own right; in between Margaret Island and the Castle District, along the Danube on the Buda bank, are the Király baths on Fo utca. It has four pools, the main one with a fantastic skylit dome dating back to 1570. It should be noted that the baths become a gay venue on male-only days. Take some time to ogle the opulence of the 1884 neo-Renaissance Magyar Állami Operaház (the Hungarian State Opera House) - arguably one of Europe's most beautiful interiors. It's worth taking a guided tour just so you don't find yourself distracted by the architecture during a performance. Situated within Erzsébet Town, the charming old Jewish quarter and former ghetto, the Great or Central Synagogue is the largest in Europe and the second largest in the world, able to seat 3,000 people. Completed in 1859 the style is typically Byzantine-Moorish, with exquisitely patterned brickwork in the red, blue and yellow colours of the city’s coat of arms. Gilded domed towers, archways and beautiful window designs are just some of the features that make this one of Budapest’s landmarks. The splendid interior glitters with lights; gilded arches and balconies line the walls, the ceiling is covered in Stars of David, and the floor is tiled in decorative stars. On Jewish festivals it is packed with Jews from all over Hungary who come to celebrate within its splendour. Next door is the Jewish Museum containing relics from the Hungarian Jewish Community, including religious objects from festivals, and the Holocaust Memorial room. In the courtyard is the Holocaust Memorial in the shape of a weeping willow tree, each metal leaf engraved with the names of Nazi victims. The Royal Palace has been burned, bombed, razed, rebuilt and redesigned at least six times over the past seven centuries. It's now an 18th- & early 20th-century amalgam reconstructed after the last war. Take a majestic walk through Ferdinand Gate, under Mace Tower, to the Turkish cemetery or relax in the palace gardens behind the Budapest History museum. The palace houses the impressive Hungarian National Gallery (with a huge Hungarian art section), the Széchenyi National Library & the Budapest History Museum. On the banks of the Danube stands one of the world’s most beautiful parliament buildings, an imposing sight and a prominent feature of the city’s panorama. With its red dome and white stone lace ornamentation and spires it is the city’s most decorative structure. Stone lions flank the entrance guarding a rich interior of marble and gold, statues and columns, and magnificent artefacts, including the 1,000-year-old crown of the first Hungarian King, all of which can be viewed on a guided tour. The grand edifice, stretching for 820 ft (250m) along the embankment, is one of the biggest national assemblies in the world. One of the city’s popular but more bizarre attractions is Statue Park, containing the giant figures of the Communist era that once filled the streets of Budapest. After the change in the political system the monuments glorifying Communism were banished into the exile of this outdoor museum and among the statues, busts and monuments are the forms of Lenin, Marx and Engels, as well as memorials to the Soviet Soldier and the Communist Martyrs. This is the only collection in the world from the time of Communist politics. Some of the interesting souvenirs sold at the park are cans of air from the ‘last breath of socialism’ and Stalin and Lenin shaped candles. Situated in the centre of the Castle Quarter, the 700-year-old Church of Our Lady is popularly known as Matthias Church after the nation's famous ruler, King Matthias (1458-90), a patron of learning and the arts who reconstructed the Hungarian state after decades of feudal anarchy. With its distinctive multicoloured tiled roof and Gothic spire, the church is one of Budapest’s best-known structures, and it was here that the nation’s kings were crowned and King Matthias was married. Today the church continues to hold High Mass, as well as concerts, organ and choir recitals owing to its magnificent acoustics. 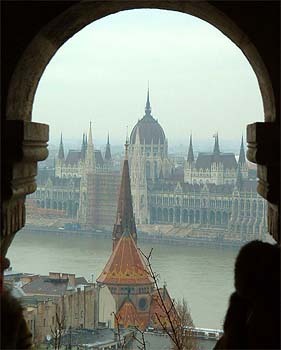 Matthias Church is a mixture of styles from the various kings, occupations and periods. When the Turks occupied the Castle in 1541 it was converted into a mosque, and the interior walls were whitewashed and painted over with scenes from the Koran. It suffered heavily in the later siege and was restored again in the 19th century, reconstructed in its characteristic neo-Gothic style, and remains of the original medieval frescoes were discovered underneath the whitewash. The interior is richly decorated with gilded altars, statues, rose windows and frescoes. Inside is the Church Museum, which gives access to the crypt, and a small collection of religious treasures and jewels. A fantastic paradox is visible in the reflection of the Gothic church in the sleek dark glass sides of the contemporary Budapest Hilton alongside. Built in 1905 on the medieval castle walls, the neo-Romanesque ramparts were so named after the city's fishermen whose duty it was to defend this side of the hill during the Middle Ages, but the existing bastion never actually served a defensive purpose. It is solely ornamental with gleaming white cloisters and stairways connecting seven turrets symbolic of the Magyar tribes that conquered the Carpathian Basin in the 9th century. Set back from the ramparts is an equestrian statue of King Stephen, a memorial to the founder of the Hungarian nation. The view from Fisherman's Bastion, over the Danube, the Chain Bridge and the Parliament Buildings with Pest stretching out into the distance, is outstanding. Floodlit at night, the bastion is a mesmerising sight from across the river. The most famous square in Budapest. Located on left-hand side of Hõsök tere (Hero's Square). One of the largest Spanish collections outside of Spain. Italian collection and other famous works. One of the oldest zoos in the world, it is home to 500 species of animal and 4000 types of plant. The park, which is also an historical site, recalls the atmosphere of the turn of the century. The facilities of the 150 year old amusement park offer a great variety of entertainment to both children and adults. Dedicated to the first king of Hungary, the church is one of the most important religious sites in Hungary. The traditional and modern facilities of the 150 year old Luna Park offer great entertainment for both children and adults. The exhibitions in the labyrinth of natural and artificial passages underneath the Buda Castle guide the visitors through the span of Hungarian history.